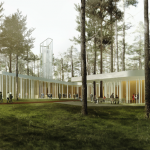 The goal of Arvo Pärt Centre, to be opened in autumn 2018, is to preserve and explore the creative heritage of the composer in Estonia – his home country. The building will include a comprehensive personal archive, a library, a 140-seat auditorium, an exhibition hall, a video room, and classrooms. It is possible to conduct master classes and organize world-class concerts there. This unique building is in line with Arvos’ creative nature and is open to all music enthusiasts.